Our new GILL® battery aviation-specific BatteryMINDer® battery charger-maintainer-desulfator is the most advanced we have ever produced. In addition to charging and maintaining sealed or wet cell (filler caps) GILL® aviation batteries users can now determine the level of charge remaining in their battery, and if weak and in need of replacement, before going bad. Units test for weak/dead cells and will recover weak or severely discharged batteries that other chargers would reject. Known as the CEC1-AA series they feature advancements in easy to understand battery analysis and condition not previously available in any other single model. Their high efficiency design, controlled by industrially-rated microprocessors, allow continuous operation (24 hrs/day) for less than $0.43/month* Temperature sensors prevents over/under charging from freezing to 130-F. These chargers-maintainers-desulfators are designed for all size and type 24-Volt GILL® Aviation Aviation Batteries. If you want the longest possible life and performance from your batteries there is no other product better at doing just this and BatteryMINDer® Guarantees it! NOT FOR USE WITH THE GILL® LT 7000 SERIES. Please use the BatteryMINDer® Model 244-CEC1-AA-S3. 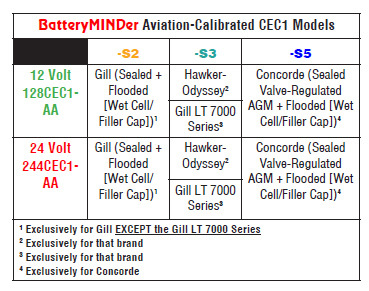 After a lot of research and comparing of products, I decided to go with BatteryMINDer as is the only battery charger endorsed by my Aircraft's battery manufacturer, has desulfation capability and the best warranty of 5 years. I am real pleased with the quality of the product and would highly recommend it, honestly!! until I had had it in operation long enough to evaluate its operation. I attached it to my current Gill G241 battery and left it for two weeks then checked the rested battery. It did not seem to be quite restored so I gave it another two weeks and checked it again. This time it seemed that the battery had been restored to a near-new voltage level and that battery has been in service for 3 1/2 years! I'm hoping for at least a one year life extension for this battery. If so, I feel that I will have recovered at least one half the investment in the charger. My next project is to try it on the older battery that preceded it and see where that goes. It will definitely be a challenge! Click the button below to add the BatteryMINDer® Model 244CEC1-AA-S2: 24V 4 AMP GILL® Aviation Battery Charger-Maintainer-Desulfator to your wish list.